These Wireless Sensor Interfaces Work with bridge type devices with mV/V outputs such as resistive load cells, torque sensors, pressure sensors etc. as well as with analog devices with -5V to +5V DC outputs. At the moment, we are only able to guarantee that you'll get at least 1 reading per second data update rate, although some users may be able to get as much as 10 samples per second depending on their processor speed, WiFi throughput and other factors. Access Setup Instructions for configuring your DI-1000WiFi. 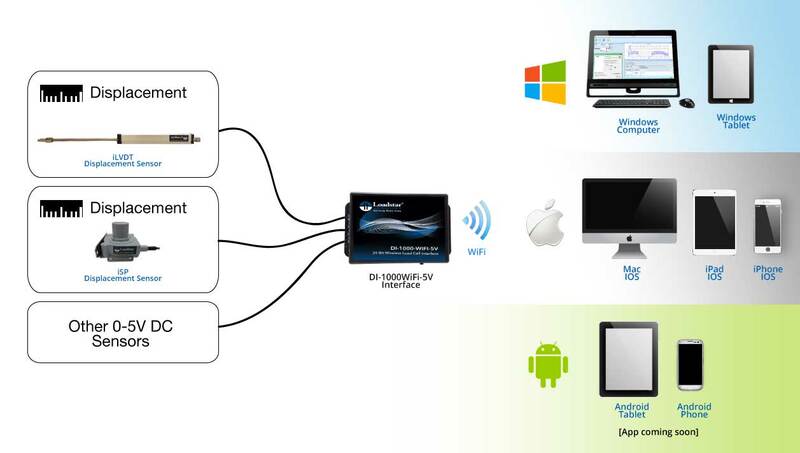 If your application requires a load cell to be connected to a PC, Tablet, SmartPhone or other devices via WiFi, the DI-1000 WiFi Digital Sensor Interface makes it easy for you to do that. The DI-1000 is a digital interface with a 24-bit ADC that can handle inputs up to +/- 2V with a variable gain setting that can be set depending on the type of signal available and provides a native USB output and an optional wireless output. There is a terminal block to connect the external sensor to it more easily than in the case of the DI-100U. DI-1000WiFi with a wireless WiFi TCP/IP protocol. The wireless versions both can also be operated on a Windows PC or Mac or Linux machine via USB. 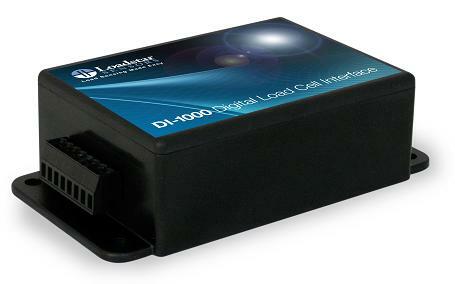 The DI-1000WiFi has a built-in cordless rechargeable battery that can be used for true cordless operation. In continuous operations mode, with a full 8 hour recharge, one can expect between 6-8 hours of use. The DI-1000WiF-5V can be used as a general purpose WiFi Data Acquisition system for use with sensors such as LVDTs, temperature sensors etc. that have a 0-5 V DC Output. 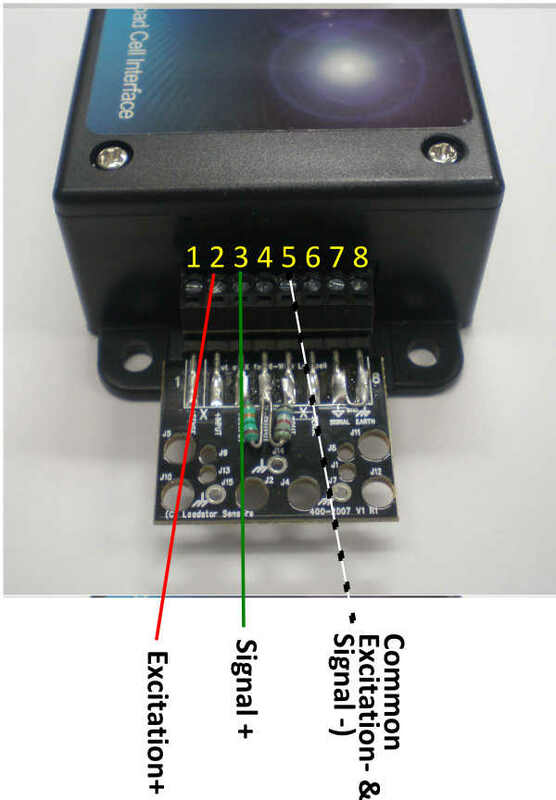 To start using one of these interface devices, simply connect the load cell to the terminal block on the interface device. Install the drivers provided on the software CD shipped with the product. Once installed, connect the USB connector to the PC via the USB port. The load cell appears on the PC as a virtual COM port when connected via the USB cable. If using the WiFi connection, the device shows up as a TCP/IP port with its own IP address. 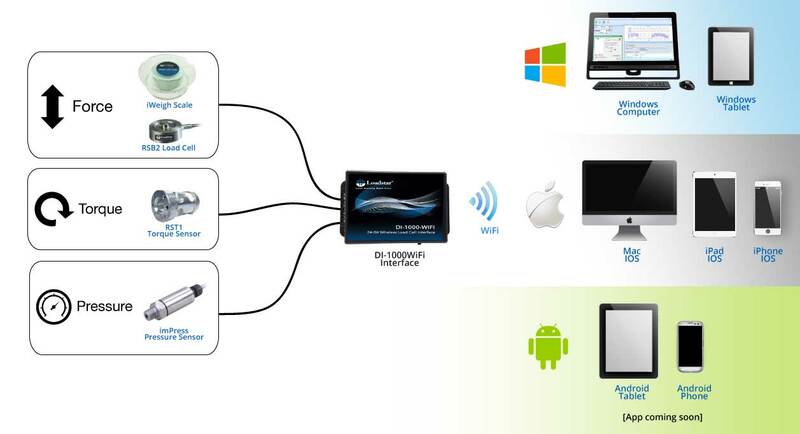 Please refer to the instructions on how to set up the DI-1000WiFi to connect with your WiFi Network and obtain an IP address. Using a standard terminal emulator you can send commands to the sensor to display loads on screen. If you type the "?" command, you can see all the available commands on the device. Before using the load cells to measure, you need to calibrate the interface device to work with YOUR load cell. 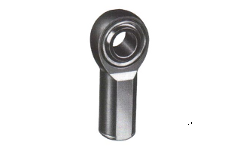 If you purchased the interface device with a load cell from us, it will come pre-calibrated. If you bought it stand-alone, then either enter the calibration coefficient (typically 2 mV/V) into the interface device via ASCII commands or perform a two point calibration with a known weight. Once calibration is complete, you can view forces or weights in millipounds. Please refer to the manuals page for calibration quick start guides.